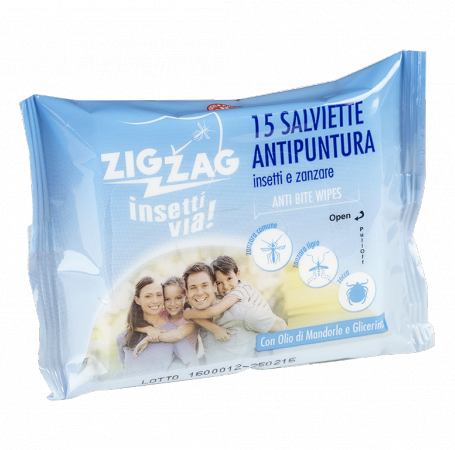 Soft towels made from scented IR3535 Citronella that protect your skin and that of your children for over 4 hours from common and tiger mosquitoes (Culex pipiens-Aedes albopictus) and ticks (Ixodes Ricinus), cooling it gently and keeping it dry and pleasantly scented. Aloe vera, glycerin and almond oil in the formula, make it a product with strong protective, softening and soothing, perfect for taking care of even the most delicate skin. Repeat if necessary. Remove the towel from the bag by raising the adhesive tab, move the towel on the skin, carefully avoiding the areas around the mouth and eyes. Be sure toclose the container tightly to prevent the evaporation of the substances present in thetowel itself. Avoid contact with eyes. Do not use on abraded skin or on wounds.